People who bought property on a development in Tala that is sliding down the hillside are to be offered alternative homes in Paphos of equal value and with Title Deeds by Tremetoushiotis developers. THE developers of a stricken, now deserted Tala project which appears to be slowly sliding down the hillside say they would never have gone ahead with construction if they had been aware that the land was ‘problematic’ to build on. The development consists of 14 units: four apartments, two villas and eight townhouses. The latter are at a skeleton stage and face directly onto a busy road which leads to the Kamares village development in Paphos. Following heavy rains two years ago, a large crack appeared in the road below the development, which is a busy hub for traffic to and from Kamares village. Police had to temporarily close the road, diverting traffic from the area. Tremetoushiotis Developers Ltd – operating under the umbrella of Top Cyprus Properties – was responsible for the construction of the development and is now being sued by the Paphos district office, according to Evagoros Andreou, head of the planning permits department. Andreou confirmed though, that all of the necessary permits and licences were issued for the project prior to construction. Christos Tremetoushiotis told the Cyprus Mail that the developers were unaware that the plot of land wasn’t ‘healthy’ – although he says that locals had been aware of the problems for many years. Tremetoushiotis stated that such points may include the presence of underground water for example. The developers said they now believe this is the case with the Tala site, but they did not know prior to construction, and the permit mentioned nothing. “When the authorities tell you that everything is OK – they have access to all of the geological maps and other information – you believe them and go ahead,” he said. The developer admitted that Tremetoushiotis didn’t undertake an independent survey prior to construction but added that this was common practice. “No developer would spend an extra 10-15 thousand Cyprus pounds [the currency at the time] for no reason to undertake a survey when you have already been issued with all of the permits,” he said. Construction got underway and half of the entire project was completed – including one block of four apartments and one detached villa – and those properties were delivered to the clients. Heavy winter rains soon revealed a problem. The construction of the upper road – an access dead-end road to the project – had been carried out ‘incorrectly’ by the authorities, the developer said. He said insufficient measures were taken by them to ensure that the huge amount of rain water which sometimes cascades down the mountain side would be taken away safely instead of being able to get into the site. “Usually properties built on hills or inclines have a half a metre trench built which takes the water somewhere safe. We had done our own rainwater drainage; it was carefully studied and calculated for our properties, but it cannot cope with torrents from the hillside,” Tremetoushiotis said. The developer stressed that if they had known that the hillside was ‘dangerous’ they wouldn’t have purchased the land. 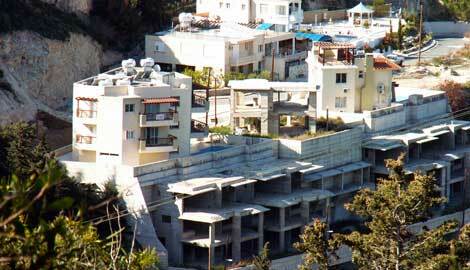 According to Tremetoushiotis, the project cost over two million Cyprus pounds. All residents and owners were forced to leave after authorities deemed them unfit for habitation. “It would be very costly to put right now,” he said, but was unwilling to comment on whether the development would have to be demolished. But it seems that all is not lost for home owners at the development, as Tremetoushiotis says they will be offered another Paphos property of equal value. “We have approached four of the five owners to offer them an informal proposal, which we will do legally in the near future. We will cancel the contract of sale and swap these properties with one of our other completed properties in Paphos of the same value as the client paid. These properties have title deeds,” he said. He conceded that this was not an ideal solution as the properties won’t be in Tala but in other areas of Paphos. “But at least they will have a property and be compensated this way. We are not in a position to give cash back,” he said. Tremetoushiotis said it is important for the company to continue to have a good relationship with their clients and the authorities. “We are trying to be fair to our customers and do what’s best for the company. Our reputation is important to us and we do not want this situation in Tala to damage that,” he said. President of the Paphos branch of the Cyprus Civil Engineers and Architects association, Chrysostomos Italos carried out a study of the area and is due to visit the site again in the coming days. He said that the main reasons for movement at the site were due to excess surface water and poor quality soil. “Although there is considerable subsidence at the site – some properties are visibly leaning to one side – at present the area is safe,” he said. Everyone who lives around the site and virtually all the Kamares residents who pass by the monstrosity have known for years that the area flooded. There used to be a mini lake on the bend every year fed by a stream. The developer is totally at fault. I cannot believe that during construction they didn’t notice the stream and the damp conditions. Believe nothing you hear and only half of what you see. ??!! Andy has pointed to one flaw in the developer’s story – the responsibility for a site survey. Paphos district contains many areas where the clay sub-soil or other factors mean it is dangerous to build because land slip is likely. The Cyprus Geological Survey Dept (GSD) is on record as saying that it is the responsibility of the developer to engage the necessary appropriately qualified and experienced engineers and geologists to establish the stability of any proposed structure and of the surrounding area on which it will be built. It is likely that the developer is being prosecuted because this was not done. Assuming the land was safe because the permits did not mention could be viewed as gross negligence. “Come on Cyprus make a new start in 2014”!!!!!!! Do not cancel your contract with the builder until you have a new property and the deeds in your hand. Our developer did this with 2 clients on our site and promised them he would repay the full amount once the properties were resold. The contracts were cancelled which left the developer free to resell. He did resell and pocketed the proceeds. The clients sued the builder but ended up with nothing but a judgement. The builder has now vanished and is in liquidation. I do hope that in the TALA case everything works out OK but how can a small developer afford to lose over 2 million Cypriot pounds. This act of apparent generosity is unprecedented in Cyprus and I go back 65 years. If this proves to be the case and the alternative properties are of equal value and acceptable then Tremetoushiotis deserve to be highlighted as an honourable operator at least in this case. I am certain the current owners have had their fair share of argument with them but for whatever reason the offer appears on the face of it to be an equitable solution given the state of the economy. It does however highlight the inadequacies of those issuing the permits and licences and brings into question whether or not they are fit for purpose. There is so much wrong with the construction process and industry that it would seem nothing short of a complete overhaul from top to bottom will not change anything and I’m not certain the government have the will or the expertise to accomplish that. At least as far as I can perceive, if their offer is for real for these unfortunate property buyers. Tremethoushitois Developers, have a basic sense of honour and decency. RB. @andyp – Let’s hope that the developer of the estate at Armou that is slipping down the hillside makes a similar offer to the families who bought there. That said you have got to give some credit to this developer for at least and at last stepping up to compensate the buyers.